In Remembrance of the end of World War I on November 11, 1918, 90 years ago today. Early in the morning on November 11, 1918, after days of negotiations, Marshal Ferdinand Foch, the Allied Commander-in-chief, and Matthias Erzberger, a prominent German politician signed an armistice treaty between the Allied forces and German forces, bringing an end to fighting associated with The Great War. The treaty, signed just after 5 in morning in the forests outside of the French town of Compiègne, stated that both sides would stop fighting as of 11 AM that morning. Fighting ceased on the eleventh hour of the eleventh day of the eleventh month. The Armistice with Germany eventually led to the signing of the Treaty of Versailles, signed on 28 June 1919 that brought an official end to the war. On November 7, 1919, King George V declared that November 11 should be established as a day of observance for those who were killed during the war. 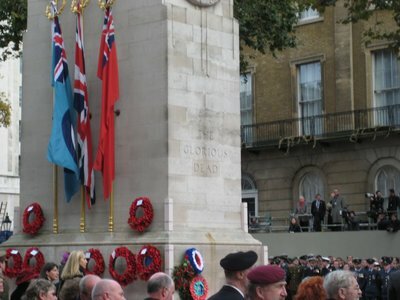 The day, known mainly as Remembrance Day, but alternatively known as Armistice Day or Poppy Day, has been celebrated ever since in the Commonwealth. Americans observe Veteran's Day today, a holiday with roots dating back to 1919, though it has not always fallen on the 11th of November. 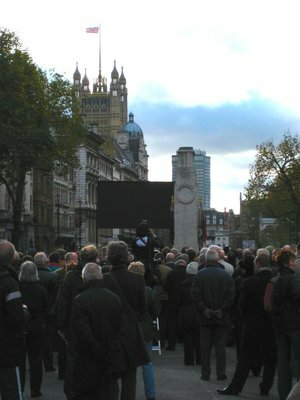 Here in London, there are multiple commemorations held around the region. 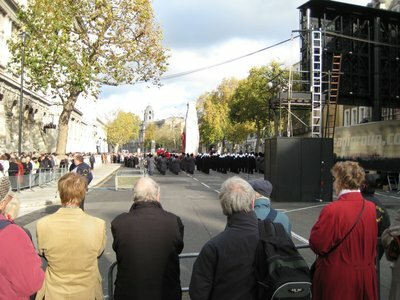 The main, national commemoration happens on the the second Sunday of November, known as Remembrance Sunday, on Whitehall Road in front of The Cenotaph, a war memorial. There is an additional ceremony held on November 11th itself. 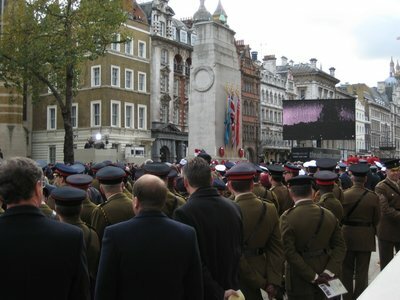 The commemoration on Remembrance Day started with a short service conducted by the Bishop of London, which includes prayers, hymns sung by a choir and some music played by the assembled band. Three veterans from the first World War, now all in wheel chairs, were lead to the Cenotaph, where each laid a wreath in honour of their fallen brothers-in-arms. 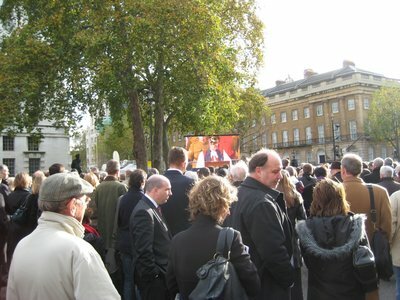 Big Ben chimed the hour, announcing the start of 2 minutes of silence. Once the echoes of the chimes from the Parliament Building's clock die away, there was nothing to break the silence except the wind rustling the leaves of the trees lining Whitehall. The silence was broken by a lone bugle, playing "The Last Post," a bugle call used traditionally played at military funerals. The Bishop asks us to pray, we the assembled crowd recites the Lord's Prayer. After we had finished, the Bishop added an additional prayer for the Lord to put the peace of heaven into all men's hearts, so that we would never have to face the horrors of war again. 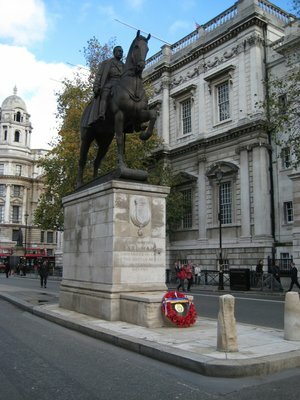 After the crowd finished singing God Save the Queen, I made my way up Whitehall Street, past the statue of Field Marshal Douglas Haig, 1st Earl Haig, who was the commander of the British Expeditionary Force. 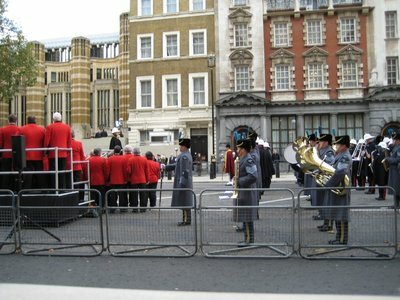 At its base was a lone wreath of poppies, bright red in the mid-day sun. The weather was cool but not cold, truly a nice day. Just the kind of day where I love to get out, spend time walking the streets or taking a hike through nature, as I have since I was a teenager. Days worth treasuring and remembering, really. 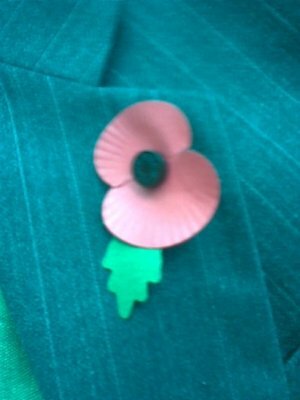 It is fitting that, then, on a day worth remembering, that we all take some time out to remember those who fought and died, and also those who have fought and lived so that we could walk through the streets on sunny days in peace. And finally for those who are out there fighting now, may they come home safely, and may some day the prayer that the Bishop of London said today come true. That some day, the peace of heaven fills every man's heart, and that the world will be at peace.